A treasure hunt of a different kind - an educational, imaginative kind! Oh my gosh, my adventurous other and I sure have been having fun over weekends (weather permitting), when we were on the hunt for story book seats! Yep, you heard correctly. 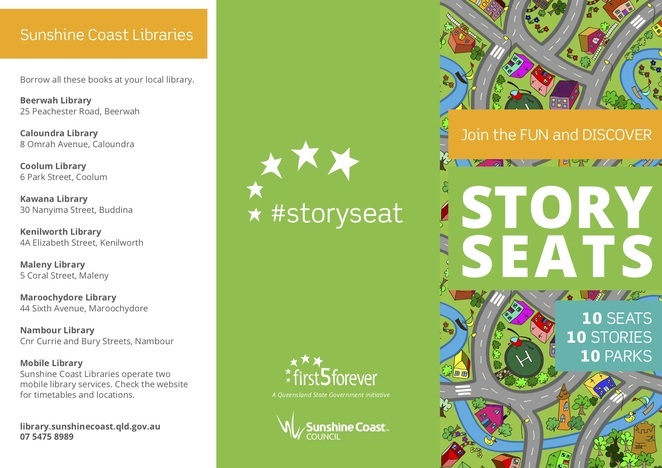 The Sunshine Coast Libraries' have only recently, officially launched ten story seats in ten stunning local parks across the Sunshine Coast region. This fabulously impressive story seat idea incorporates artwork from ten popular children's books and is designed to encourage a love of reading. How absolutely awesome is that - says one bookworm to hopefully, another! These distinctive, colourful Story Seat artworks, are designed to encourage families to spend time together outdoors - a visible, colourful way to promote a love of reading and to encourage families to participate in storytelling, active play, singing and reading. Every Story Seat has been positioned in parks that - to me - would be a child's idea of heaven, as every park is exceptional in its own right. Another article in the making for me! 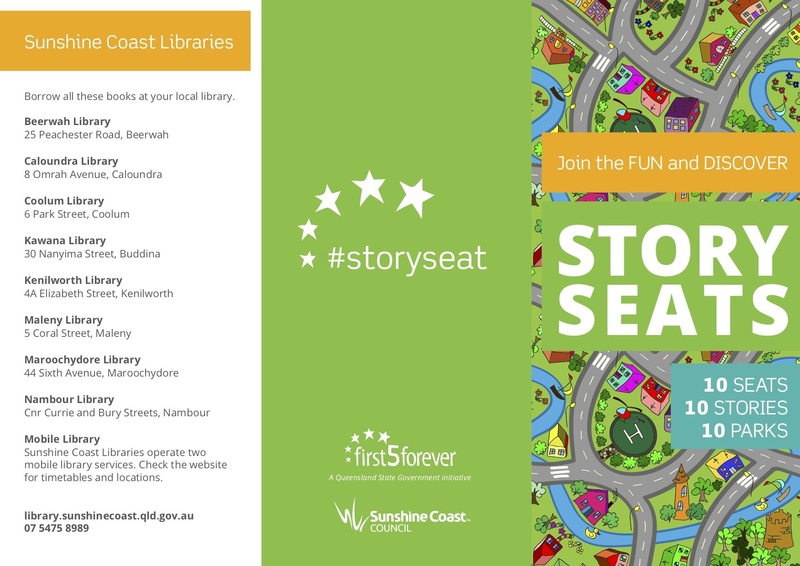 First 5 Forever, a Queensland State Government funded universal family literacy programme, funded these book worthy Story Seats. In keeping with the First 5 Forever's message 'the first five years last a lifetime' this QLD literacy programme is aimed at supporting strong language skills and appealing literacy environments, specifically for young children aged between birth and five years of age. 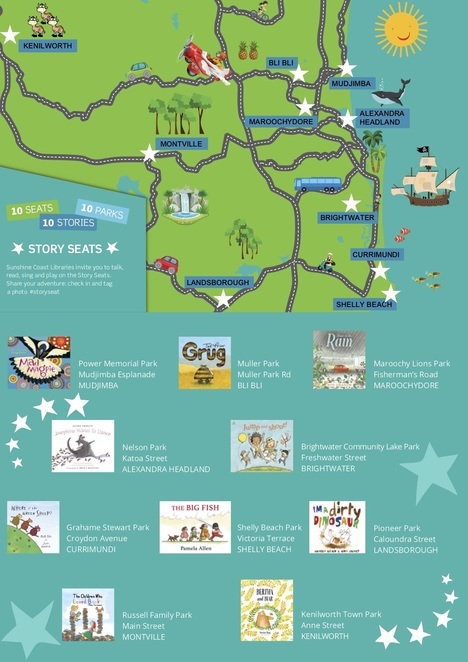 Families can get to enjoy a new adventure for ten weekends by exploring new parks every weekend in a treasure hunt for the magical family time storybook seats! I'm a Dirty Dinosaur tells the story of a grubby dinosaur's love of anything and everything unclean. The book has catchy rhymes and wonderful illustrations, ensuring that the readers will want to read it over and over again. Borrow this title and others by Janeen Brian. I splash in all the puddles and I stamp about the street, I'm a Dirty Dinosaur! Josephine Wants to Dance is the story of a young kangaroo named Josephine, who despite being told it isn't possible, is determined to pursue her dream to dance. This sweet story supports the moral that all dreams are worth chasing. Borrow this title and more by Jackie French or Bruce Whatley. Follow your dreams like Josephine! The Mad Magpie tells the story of Guluu, a magpie that is furious about being bullied by a group of annoying butcher birds. The Mad Magpie is the third book in a series of stories inspired by words of wisdom passed down to Gregg Dreise by his indigenous elders. Borrow Mad Magpie or others by Gregg Dreise. Grug is a classic Australian children's book and is the first in a topnotch series of books by Ted Prior. Grug is the story of an endearing little character who grew from a Burrawang tree and is the imaginary bush character invented by Ted Prior to share with his two young children. Grug is quite a famous fellow and with more than thirty books in the Grug series, can keep you and the littlies happy for many a day, reading on the Story Seats. Borrow Grug or others by Ted Prior. Can you find any Grug's in the park? The Children Who Loved Books is a caring story of a family who share a deep love for books, despite not having 'riches' in other ways. This amazing book has even been featured on ABC TV's Playschool as well as having been translated into different languages around the world. 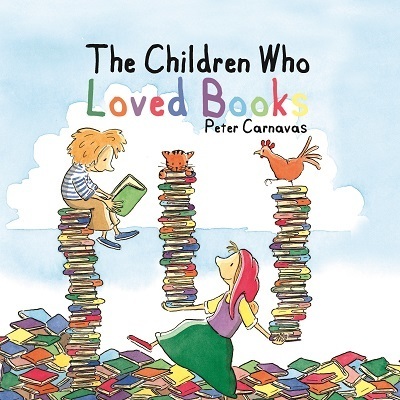 Borrow this title and more by Peter Carnavas. Bertha and Bear is an uplifting tale of a bee named Bertha who goes in search of a new home, finding unlikely friends along the way. 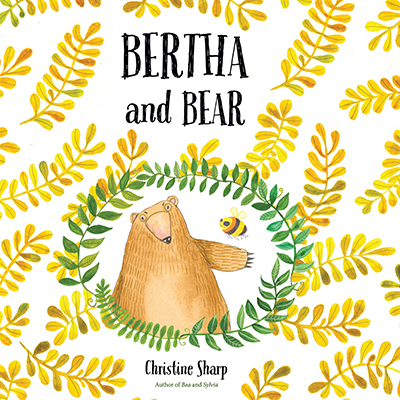 Christine Sharp's story of Bertha and Bear is like honey, too sweet to miss. Borrow this title and more by Christine Sharp. Home in the Rain is a delightful story about Francie and her mother driving home in the rain, from Grandma's house. Borrow this title or others by Bob Graham. A family were utilising the Home in the Rain story seat - I loved that! The Big Fish is a story of a little old man who uses the help of his family to try and catch an enormous fish. This much-loved children's book is a great read for all and especially for those who wish they could really catch a humungous fish. I wish, I wish, I could catch a big fish! Where is the Green Sheep? is a fun adventure story to find the mysterious and elusive Green Sheep - a journey full of suspense and surprises. Will you find the Green Sheep? Borrow this book and others by Mem Fox and Judy Horacek. Two happy families were very happy to pose for me on the 'Where is the Green Sheep' story seat - thank you ladies! Jump and Shout is a happy and upbeat story of a very lively family who spend their day clapping, cheering, jumping and shouting. Sounds exhausting! The author uses rhyme to engage his readers into an action-packed story. Mike Dumbleton, the author, has won many awards including the Federal Minister's Award for Outstanding Contribution to improving literacy. Borrow this book and others by Mike Dumbleton and Peter Carnavas. As you will notice, I have deliberately only given readers a 'tantalising taste' for each story, hoping rather to encourage parents to locate these wondrous childrens' books at a local library (see above for local libraries) and then to go off on an adventure to find the allocated Story Seat. What fun this imaginative reading adventure is guaranteed to be! Why? To go on a treasure hunt of a different kind - an educational, imaginative kind! What a terrific idea. Thanks for writing about it Elaine.